Leading Manufacturer of ball valve making moulding machine, cpvc fitting injection moulding machine, horizontal toggle type plastic injection molding machine, household plastic injection molding machine, injection molding equipment and plastic ball valve making moulding machine from Ahmedabad. We are having wide range of Plastic Ball Valve Making Moulding Machine. The offered machine is manufactured by making use of premium grade components with the help of ultra-modern machines in compliance with set industry norms. We offer this machine to our clients in different technical specifications for our clients to choose. The PVC-series machines offer a very wide range of application for powder PVC, rigid PVC, and CPVC. The modular base machines ranges from specific range of clamp force and machine performance is optimized by offering up to three injection units per clamp size. These series machines are suitable for application in industry, sewer system, horticulture, water supply system. We are offering Horizontal Toggle Type Plastic Injection Molding Machine with range depends on client specification or requirement, product quality is best in market. We supply a wide range of Household Plastic Injection Molding Machines. These plastic injection molding machines also feature platens designed under finite-element analysis as well as stable. Knowing us a renowned organization, we are engaged in offering an extensive range of Injection Molding Equipment to meet the demands of our clients. This Injection Molding Equipment is developed under the strict supervision of experience and knowledgeable team-members, who vigilantly monitor the complete production process so as to ensure their flawlessness. Available with unique features, this Injection Molding Equipment can also be customized as per the detailed by the clients. They are easy to use and provide efficient working to the clients as per their requirement. We are a reputed firm engaged in manufacturing and exporter of Plastic Ball Valve Making Moulding Machine. Our range is huge in demand among the clients across the nation and available at market leading price. These products are easy to operate as well user friendly. This machines is appreciated for high performance, dimensional accuracy, precision designing, corrosion resistance and durability. We are manufacturer and exporter of qualitative range of Plastic Injection Molding Machine for Bottle caps that are employed in various industries. Our semi Automatic Horizontal Plastic Injection Molding Machine model. Our company is highly esteemed in offering Plastic Making Machine to the clients. This Plastic Making Machine is known for its supreme quality and hassle free performance. The offered Plastic Making Machine is extensively used in industrial applications. Our products are appreciated among the customers due to their supreme quality and high durability. The offered products are manufactured by using good quality raw material. We manufacture Plastic Pipe Fittings Molding Machine for UPVC & CPVC Pipe Fittings Applications, Our machines are equipped with PLC Controller and Servo System. We are engaged in the manufacturing and exporting of a wide collection of plastic toy moulding machine. 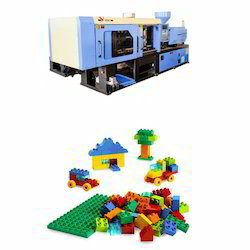 Plastic Toys Molding Machine is used to mould the plastic toys. Our products have been highly appreciated worldwide for their precision and reliability.